AN EMBARRASMENT UNTO NATIONS The late Israeli writer and academic Tanya Reinhart has been a long term principled critic of Israel's expansionist and oppressive policies vis-à-vis the Palestinians in Gaza, the West Bank and East Jerusalem. 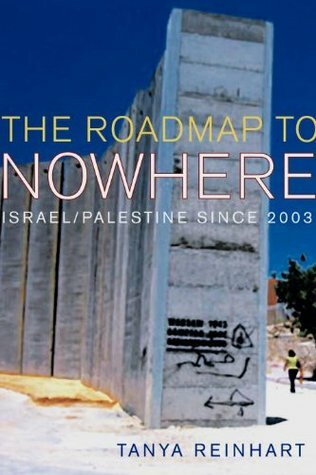 "The Road Map to Nowhere" charts the direction that Israeli policy took from late 2002 onwards, the point her earlier book ("Israel/Palestine: How to End the 1948 War") ended, as well as the Palestinian reaction to those policies. These issues are covered with an eye on the United States sponsored Road Map which promised to bring about a Palestinian state by 2005.Initially it deals with a the ceasefire of summer 2003 and the Sharon governments response, namely targeted assassinations. Reinhart provides evidence of this sequence happening on more than one occasion: Palestinian offers of ceasefires and even actual ceasefires being followed, sooner or later, by an armed response from the Israeli Defence Forces. She also charts the Sharon governments (backed by the United States with the E.U. trailing behind) attempts to exploit differences within the Palestinian camp which bore fruit during the fighting between Hamas and Fatah in Gaza during which Fatah received material Israeli support.The Gaza "withdrawal" is also put under the spotlight, Reinhart again marshals the evidence to suggest that the sincerity of Sharon's commitment to follow through was not as straight forward as was accepted at the time. She points out that the post-election Bush II government, mired in Iraq, had military sanctions that were put in place after disputes with Israel regarding military sales to China. The sanctions were only finally removed once disengagement was well under way much to the discomfort of the Israelis. Further evidence in this direction was the foot dragging of the Sharon government with regard to the necessary measures to compensate and re-house the 9,000 or so Israelis who had been settled in Gaza despite around half of them being keen to leave Gaza and start a new life in Israel proper as soon as the announcement was made. The post-"withdrawal" conditions in Ghetto Gaza are also described as well as the Israeli siege, attacks and the response from the resistance in Gaza.The story of the Palestinian election and the Hamas victory are told, the later being put into the context of Fatah's corruption and the not unreasonable belief amongst Palestinians that the Fatah/PLO dominated Palestinian Authority, or elements within it, were to an extent collaborating with the Israelis. The Israel response to the Hamas victory is also covered: loud voices complaining of the violent nature of Hamas before launching a number of violent attacks: all this while Hamas are making statements about talks and ceasefires. Orwell couldn't dream it up.The final part of the book covers the Israeli building of the "security" fence, ostensibly built to protect Israel proper from attack, Reinhart makes it's real purpose eloquently clear not least by including a map of the walls route north of Jerusalem. It's purpose is clearly annexation: a solid line of intent drawn in concrete across the occupied West Bank dividing around 400,000 Palestinians from their land and from each other. Once extended to the Jordan valley it is forecast to eat up 40% of the occupied West Bank. The declaration of its illegality by the International Court of Justice seems no more than a public relations problem to an Israeli establishment that has long been shy of International Law.The last section of the book documents the actuality of the wall for a number of Palestinian villages north of Jerusalem and includes many heart warming scenes of real cooperation between Israeli citizens, the International Solidarity Movement and the Palestinian villagers in which the author reports on at first hand. Again the depressing issue of collusion between the Fatah controlled West Bank "authorities" and the Israelis rise to the fore. The response of the I.D.F. escalates with the success of the peaceful protesters from tear gas to rubber bullets, mounted charges of baton wielding soldiers to the shooting of demonstrators with live ammunition.A valuable work that my short overview only identifies the main themes of, and an essential book for anyone interested in what happened between 2003 and 2006 in detail. It is a thoroughly sourced from mainly Israeli sources, written in clear comprehensible language and deserves to be widely read. Jeez she's so good. Or I guess she was, I think she died recently. But this is a great book about recent Israeli/Palestinian history that is made up of lots of information that is easily accessible in the Israeli press but doesn't normally get translated into English. I miss Tanya. While reading this book I kept on hearing her voice narrating it in my head. She was such an amazing person, teacher and activist, and in this book it felt like all three came together.